I have had a taste for seafood lately and have been experimenting with flavors beyond the typical butter, dill & lemon. I happened to spot some beautiful Halibut steaks at “Fresh Thyme Farmer’s Market” (Love this store) I also grabbed some fresh vegetables for one of my favorite side dishes, Grilled Ratatouille. I will share that recipe as well. It is a perfect main course as well if you have vegan or vegetarian dinner guests. Lets begin with the Halibut. It is such a firm white fish that I love to grill it. That can be a bit tricky because of potential “stick to the grill issues.” The best way to avoid this is to have a very hot grill with a clean grate. 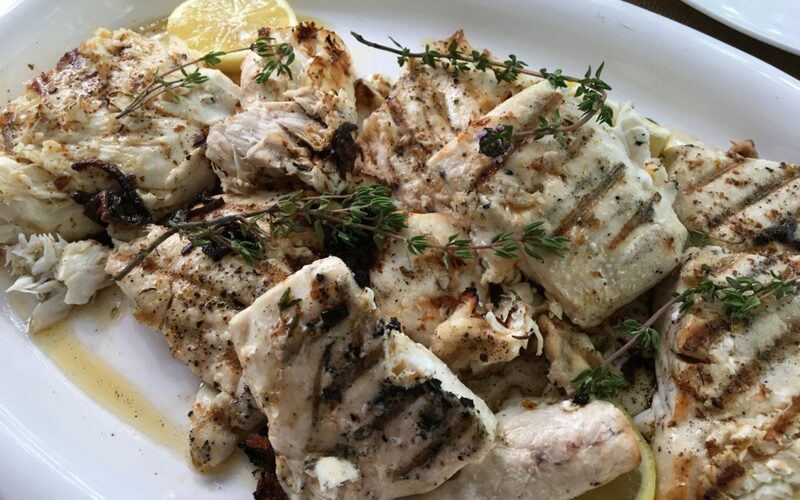 Brush the fish with a little bit of canola oil, season and place it on the grill. The most important thing to remember is NOT to move it. Cover the grill and let it do its thing. When it’s ready, the fish should release so you can turn the steaks over. This will only require about two minutes per side. You don’t want to overcook it.When the fish has nice grill marks and feels firm to the touch, transfer to a serving platter. As the fish cooks, place 2 tablespoons of butter and the shallot in a skillet on medium heat. Cook stirring until the shallot softens then add the remaining butter. Cook until butter turns golden brown. Add the orange & lemon juice as well as the zest and thyme leaves. Season with salt & pepper. Drizzle the brown butter over the fish. Sprinkle with remaining zest and a few thyme sprigs for garnish. Serve.